Professor Tan Chung (b. 1929) is a renowned historian and an authority on Sino-Indian relations and cultural exchanges. He has been a doyen of Chinese cultural studies in India for over four decades. He has taught at the Jawaharlal Nehru University (JNU) and the University of Delhi (DU) from 1964 till 1994. He has been a Research Professor at the Indira Gandhi National Centre for the Arts and Honorary Director of the Institute of Chinese Studies. Prof. Huang I-shu (b. 1932) is a founder member of the China Study Group and a member of the Editorial Board of the China Report. She is an expert on Chinese language, literature, and gender studies. She taught at the University of Delhi from 1964 till 1997, where she was instrumental in building the Department of Chinese and Japanese Studies (now renamed Department of East Asian Studies). Vinod C Khanna (b. 1939) is a former Director of the Institute of Chinese Studies. As a member of the Indian Foreign Service, he was India's Ambassador to Cuba, Indonesia, and Bhutan. During his diplomatic career he handled several responsibilities relating to Sino-Indian relations. After his retirement he served as the first Head of the India Taipei Association which looks after India's interests in Taiwan. He was educated at Bombay and Oxford, and has been associated with Harvard University as a Fellow and the University of Delhi as a Visiting Ambassador. Amb C V Ranganathan (b. 1935) served as India's ambassador to China between 1987 and 1991 when Prime Minister Rajiv Gandhi's landmark visit to Beijing took place. His diplomatic assignments also include the ambassadorship to France. He has been a Jawaharlal Nehru Fellow from 1998 till 2000. 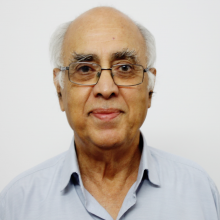 Kishan S. Rana graduated in Economics (BA Hons and MA) from St. Stephen’s College, Delhi and served in the Indian Foreign Service from 1965 to 1995. He was India's Ambassador/High Commissioner to Algeria, Czechoslovakia, Kenya, Mauritius, and Germany, and was on staff of Prime Minister Indira Gandhi in 1981-82. He currently holds positions as Professor Emeritus of DiploFoundation, Malta and Geneva and is an Honorary Fellow at the Institute of Chinese Studies, Delhi.